Where would we be without paper? Our bureaucratic academic and literary worlds, to give just a few examples, runs on mountains of paper, and despite the widespread use of computers in the western world, we are a long way yet from the green dream of working in 'paperless offices'. Our reliance on paper and paper products comes at a huge environmental cost.While nearly all our virgin wood pulp used for paper production nowadays comes from plantationsof single tree species, that are sustainably managed, the problem is the pressure for product demands that increasingly more and more space is given over to such plantations, and older, mixed species forests are threatened and replaced. If you have stood in the middle of both an older forest, full of pine, birch, oak and hazel trees, and can compare this to a plantation of just spruce – a strong, fast-growing tree commonly used for virgin paper pulp, you will always remember the difference between the two habitats. These spruce plantations, on a short planting/cutting rotation of just a few years, fail to provide the habitat for flora and fauna, and the crucial oxygen/co2 replenishment, that the fragile eco-system needs. In 2004, 6.2million tons of paper were manufactured in the UK alone, with a further imported tonnage of 7.7million. Of this first figure, about 74% was sourced from recycled paper and board products. Paper is created from cellulose fibre, which is usually pulped wood, but can include a mix of materials such as rags, straw, grasses, or cotton. See our page 'The Art of Recycling' on this site, for some tips on making paper yourself. Again, as with all the pages about different products on this site, our first and main piece of advice, is to recommend that we all make a conscious effort to cut down on the amount of the product coming in to our houses and workplace. Firstly, how much paper is used in packaging ? Is this packaging really necessary? We can choose to buy products with less packaging on, or we can leave it in the shop. We can also choose to only buy paper, paper products, or goods with paper packaging, that only uses recycled paper, or paper made from post-consumer waste. Junk mail is a big problem for most householders, but there are organizations that can enable your name to be taken off the various lists that junk mail senders use. 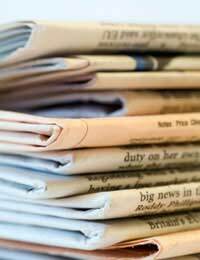 Newspapers are the main source of paper in a household. It is worthwhile assessing how important a daily paper is and cut back if it is not being read, but newspapers are nowadays made from mainly recycled paper already. An online subscription to your paper of choice might be an alternative. As well as curbside collection of wastepaper, your local Council is likely to have other facilities for recycling paper products. These include the Yellow Pages, envelopes with the cellulose windows in, pamphlets, and coloured paper. There are in fact 50 grades of paper for recycling. The important issue is that we can recycle paper, it is energy-efficient for us to do so, and we should be keeping paper out of landfill sites.